BLIND AND NAKED from Cedar Wright on Vimeo. Pretty crazy huh? Moving in a somewhat similar direction, I found this clip of adaptive downhill skiing. Not only is the music killer, around 1:00 the tricks start happening. It always amazes me and what people can overcome. This guy not only "overcomes" but excels. In 2003, I climbed Chair Peak for the first time. A post on Cascadeclimbers.com made it sound as if the route was in excellent condition. 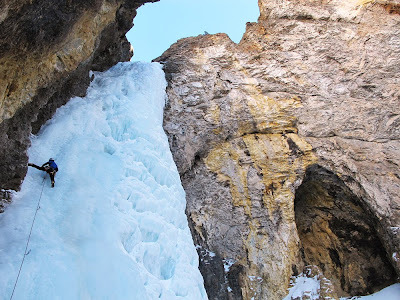 I had been ice climbing a lot that winter and wanted to up the ante...so I decided to solo the route. I arrived early in the morning, skied in and sent the route. Of course that all sounds very simple. The reality is that the route wasn't in very good shape. In fact, one might say it was in quite poor shape. There was a lot of steep unconsolidated snow on the line and the crux moves demanded mixed climbing above a five-hundred foot void. In other words, the climb was mildly terrifying. In the seven years since that ascent, things have changed. I've become a father. And this particular life-changing experience has made me quite a bit more conservative in my personal climbing. It's now hard for me to justify soloing to myself. That's not to say that I think soloing is a universally bad thing. It's just not right for me anymore. I'm still proud of that 2003 ascent. So when former AAI guide Gene Pires sent out an email in an attempt to find a partner for a Chair Peak trip, I eagerly accepted. 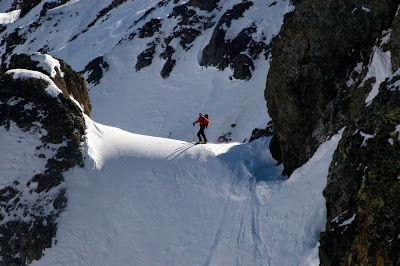 I've always wanted to go back to that mountain with a partner in the hopes of finding better conditions...and perhaps reliving some of fun of that solo without reliving the danger. I've been climbing on and off with Gene since we met in college in the early nineties. He's always been a reliable partner who is more than ready to joke about pretty much anything. He also has a toddler that is about the same age as my daughter. In other words, half the day was spent talking about climbing and the other half was spent talking about potty training. It was a lot of fun to spend the day with an old friend. 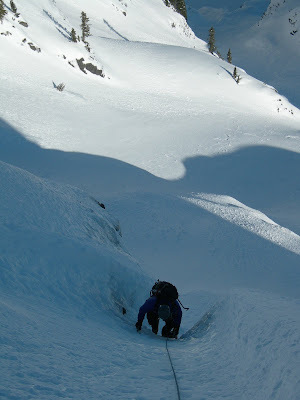 We made the approach on snowshoes and climbed the route in good style, swapping pitches to the top. We found excellent conditions. The line was "in-shape" and was composed of a mix of water ice and neve. 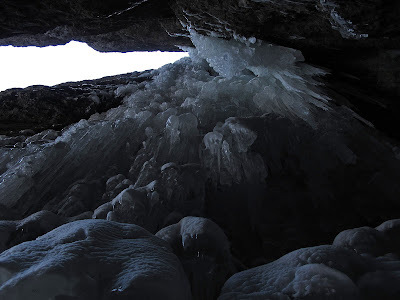 The route varied in angle from fifty to seventy degrees with occasional spots of thin ice over rock. There was almost no comparison to the way the route was in 2003. Back then it felt extremely insecure. On our recent ascent, with the exception of a handful of thin moves, it was an absolutely delightful climb. 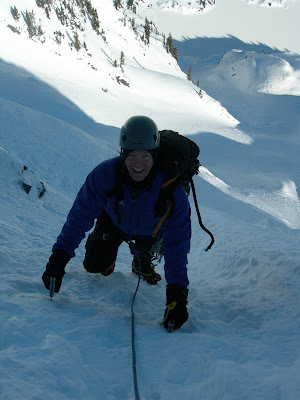 The Tooth is a popular peak with an easy multipitch line on the south face. The peak can be seen in the center of this photo. Jason following the first pitch. Your compass is pointing in the wrong direction. You know it's not north. Indeed, it's nowhere near north. So what's up? Is it broken? Defective? What? The problem is that it's not pointing at "true north." Instead, it's pointing at "magnetic north." Most people don't realize that there are two North Poles, the real one and the fake one, the true one and the magnetic one. Why are there two different poles? Good question! The magnetic north and south poles are the ends of the magnetic field around the earth. The magnetic field is created by magnetic elements in the earth's fluid outer core and this molten rock does not align perfectly with the axis around which the earth spins. There are actually many different sources of magnetic activity around and in the world. All those influencing factors combine to create the north and south attractions at each spot on the globe. The actual strength and direction of 'north' is slightly different everywhere, but it is generally towards the 'top' of the planet. The difference between true north and magnetic north is referred to as the declination. If you are not aware of the declination in a given area, then you may not be able to locate true north. with a "positive" (or "easterly") variation from geographic north. Modern compasses are designed in such a way that the declination may be set. If you adjust the compass properly allowing the arrow to line up, then you will get a reading which shows both where true north is as well as magnetic north. Most compasses require one to set the red compass point a given number of degrees off of true north. Usually there is a screw on the back of the compass that will allow you to set the declination. Two lines, often referred to as "the shed," will shift the appropriate distance off of true north. Once this is set, you will be able to shift the compass to the point where the needle is in the center of the shed. The printed "N" will then point toward true north. Magnetic declination varies both from place to place, and with the passage of time. 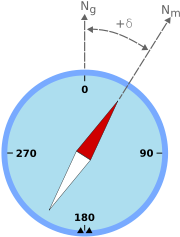 As a traveller cruises the east coast of the United States, for example, the declination varies from 20 degrees west (in Maine) to zero (in Florida), to 10 degrees east (in Texas), meaning a compass adjusted at the beginning of the journey would have a true north error of over 30 degrees if not adjusted for the changing declination. In most areas, the spatial variation reflects the irregularities of the flows deep in the earth; in some areas, deposits of iron ore or magnetite in the Earth's crust may contribute strongly to the declination. Similarly, secular changes to these flows result in slow changes to the field strength and direction at the same point on the Earth. The magnetic declination in a given area will change slowly over time, possibly as much as 2-2.5 degrees every hundred years or so, depending upon how far from the magnetic poles it is. This may be insignificant to most travellers, but can be important if using magnetic bearings from old charts or metes (directions) in old deeds for locating places with any precision. There are many ways to determine the declination. The first and most common way is to simply get it off of a USGS topo map. Unfortunately many maps are out-of-date and the declination may have changed. You may also get your declination from the web at the NOAA website, here. To learn more about compasses and declination, the Compass Dude has a great site with a lot of valuable information. Knowing how to use your compass well will help to keep you from getting lost... And staying found makes every trip a lot more fun! A few weeks back I posted something in relation to aid climbing, which of course gets me interested in big walls. I found this video of some guys taking some solid whips off of what they are arguing to be the most difficult big wall to date. This is a trailer to a longer film by BigUP Productions. The following may as well be a trailer to a blockbuster film! I've got a couple titles already planned - "The Men with the Golden Cams," "Sending Takes Forever," or "The Asgard Project." Wait... the last one is the actual title. If you can put up with my horrible attempt to play off of James Bond Titles, you will accept the fact that this climbing film has the potential to thrill and create suspense in any viewer, just like 007 does. Check it out. For the fifth-year running, the American Alpine Institute will be a key sponsor at the Red Rock Rendezvous in Red Rock Canyon. 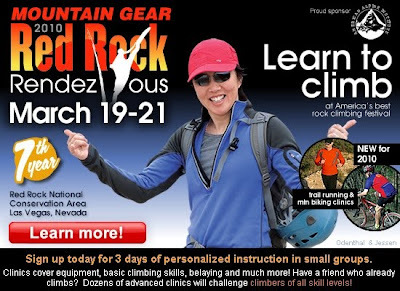 Las Vegas, Nev. – The seventh annual “Mountain Gear Presents: Red Rock Rendezvous” (RRR) rock climbing festival announced its initial list of expert climbing guides to lead the event’s scheduled clinics. Clinic guides include internationally renowned athletes such as: Peter Croft, Alex Honnold, Brittany Griffith, Olivia Cussen, Matt Segal, Emily Harrington and the guides of the American Alpine Institute. night, a blow-out party on Saturday night, pancake breakfast Sunday morning and service projects to assist in the environmental conservation of the Red Rock Canyon and Spring Mountain. RRR will also again offer a special “Intro to Climbing: UClimb” day designed for less experienced climbers and those who have never attempted the difficulty levels of the Red Rock Canyon. The intro day will be held on Friday, March 19 and will be hosted by UClimb, an organization designed to teach all ages how to rock climb in comfortable, small-group settings with other amateur climbers. The full-day introduction clinics will teach climbing fundamentals to succeed at the Red Rocks and other outdoor settings. be an optional gear package that will include harness, helmet, shoes, belay device, carabineer, chalk bag and a membership to the Access Fund. The gear package with the “Intro” day and the weekend climbing clinics is $349. March 18 -- Banff Mountain Film festival in Las Vegas. March 26-28 -- Local Climbing Organizations Spring Summit hosted by the Access Fund and the Las Vegas Climber's Liaison Council. Click here for contact information. In addition to all of the events going on around Red Rock Rendezvous, don't forget that AAI will have a lot of guides available for private guiding and instruction in Red Rock Canyon. To learn more, send us an email at info@aai.cc or give us a call at 360-671-1505. Everett, Wash. Feb. 17, 2010— The Forest Service has closed Tinkam Road (Forest Service Road 5500) at milepost .5 for logging 8 a.m. Monday through noon Friday until mid-March. Tinkam Road parallels the south side of I-90 from exit 42 to 47. The road will open for traffic Friday noon through Sunday and holidays. Hikers can still reach Asahel Curtis and McClellan Butte trailheads. The road is closed for public safety. “Tinkam Road is narrow with limited turnarounds. The area is not safe for public access with timber equipment that includes a loader, yarder, log decks and skyline cables,” said Jim Franzel, Snoqualmie District Ranger for the Mt. Baker-Snoqualmie National Forest. Access to some recreation sites may require backtracking from exit 47, rather than ascending up the South Fork valley from exit 42. After the thinning on the south side of I-90 is complete, harvest operations will move in late spring and summer to the north side of I-90. Call Snoqualmie Ranger District for updates at 425-888-1421, or stop by the office at 902 S.E. North Bend Way, North Bend, Wash., 98045. For updated information about trails and roads, go to alerts and conditions on http://www.fs.fed.us/r6/mbs/ . There's no question about it. When your forearms are fried, the dishes are done. You're going to fall off your route. Technique is important for climbing and it can save your strength. Indeed, on routes with a rating below 5.8, strength may not even be an issue if your technique is adequate. But as you start to push up through the grades, you'll find that forearm strength becomes more and more important. The more you train your forearms, the stronger you'll be. And the more you train your forearms, the more likely it is that you will be able to rest them quickly and adequately by shaking out or finding a stance on which to take a break. You probably remember from your days of lifting weights in the high school weight room that muscle is most effectively built when you workout until muscle failure. Commonly, an athlete will work a specific muscle group by lifting a weight a number of times (referred to as reps) until the muscle fails. Most will know that with a given weight, the muscle will begin to fail after a given number of reps.
A static hang works the muscle in much the same way. For this to work effectively, you have to hang until your muscles fail. This doesn't mean that you have to hang until it hurts or even until it hurts a lot. You have to go beyond those thresholds to the point of complete muscle failure. After failure, allow the muscles to rest for five minutes or so and then try again. Ideally, you will do this exercise three or four times in order to get the most out of it. Hang on a bar or a hangboard with both hands. Drop one hand and shake it out while still hanging on the other. Hang for at lease five seconds on one arm before switching. This particular exercise is great for climbers because of the way it imitates real life! There are two effective ways to do forearm curls. One may use a regular barbell or a dumbell. To use a barbell, you will need to lay your forearms across a weight bench holding the barbell. Your hands should hang over the edge, palms up. All the bar to roll toward your fingers and then flex, bringing it up into your palm. With a dumbell, the system is almost the same. Allow the dumbell to roll out toward your fingers and then flex, allowing int to roll back into your palm. With both of these exercises, it tends to be more effective to work toward a combination of strength and endurance by working on time as opposed to reps. Try to do as many curls as possible in a minute and then work up from there. Remember most sport routes take five to ten minutes to climb, so that should be a goal in the exercise. One of the best ways to build forearm strength and endurance is to traverse around the climbing gym on easy holds. Try to stay on the wall for at least twenty minutes. Another version of this same exercise is to try to down-climb the routes after you reach the top. As with other excercises, a series of these twenty minute sessions will be more effective than a one time run at them. There are a number of different commercial forearm exercising devices out there. Perhaps the most popular is the blue latex rubber doughnut. The value of these devices is that they work out both fingers and forearms. This should be used like any weight device. Do a series of reps until failure, rest and then repeat two more times. You can find more on forearm workouts here. For information about why forearms pump out and about lactic acid buildup in forearms, click here. With the weather being completely wonky this year in the Pacific Northwest and seemingly everywhere else in the country, you really start to appreciate those beautiful days in the mountains. I feel like we get so hung up on the climbing and skiing, and don't stop to realize how beautiful our surroundings are. I feel like a beautiful sunset or cool crisp morning should get us just as stoked as a killer line or splitter crack. This video does a good job of making you appreciate this world we live in. 40hr Inukshuk timelapse from Rocky Mountain Sherpas on Vimeo. Obviously though, our goal is to take advantage of the beautiful days and get out there. Here are some guys that are just getting out and hucking big. 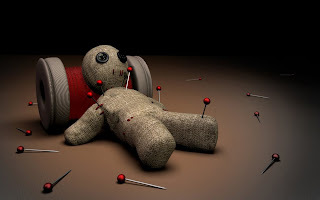 According to TheMystica.Org, "gris-gris resemble charms or talismans which are kept for good luck or to ward off evil. Originally gris-gris were probably dolls or images of the gods, but presently most gris-gris are small cloth bags containing herbs, oils, stones, small bones, hair and nails, pieces of cloth soaked with perspiration and/or other personal items gathered under the directions of a god for the protection of the owner." The word arete was derived from Greek. It originally meant the goodness or the virtue of a person. Answers.Com notes that, "in the thought of Plato and Aristotle virtue is connected with performing a function (ergon), just as an eye is good if it performs its proper function of vision. This is its telos or purpose (see also teleology). Aretē is therefore identified with what enables a person to live well or successfully." Knowing the background of climbing words will not make you a better climber. It will not allow you to fit your fingers into a tinier crack or crimp a smaller hold, but it will give you something cool to talk about at the crag. And really, part of the fun of climbing is talking about cool stuff with people you met at the crag...! So obviously, you do what any big and tough climber would do in such a situation...you scream like a little girl. And while all that is going through your head, your partner laughs. And then tells everyone about your little girl scream for years and years and years. 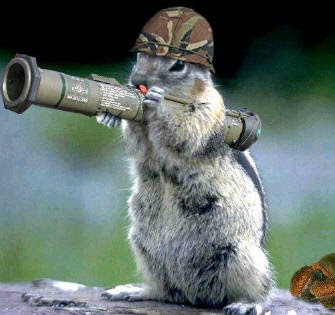 While being attacked by a squirrel might give your partner a great story, it could also be very dangerous. Animal bites can happen on any type of trip. And the most important thing a victim can do is to note what kind of animal it was that attacked and what the nature of the attack was. Were you poking it with a stick and throwing rocks at the animal, did you disturb it's "nest," or did it just seem to attack for no reason? Don't mess with me, I've got a lot more than rabies. Unprovoked animal bites are particularly dangerous. The unfortunate likelyhood is that warrantless animal attacks are due to rabies, which is almost always deadly in humans who contract it and do not receive treatment. As a result, animal bites must be taken extremely seriously and medical attention should be sought with all animal bites. Puncture wounds are also dangerous. Animals teeth are covered in bacteria and a bite that breaks the skin could inject said bacteria deep into the tissue. Infection from such a bite develops extremely quickly. A serious infection can develop in as little at 24 hours. Tetanus -- a life-threatening illness -- can develop from any bite, human or animal. Additionally, bites to the hand, the wrist, the foot or a joint can be very serious. Bite wounds to the hand may result in major complications because the skin's surface is so close to the underlying bones and joints. Other wounds in such areas could create life-long disabilities without proper treatment and antibiotics. I officially completed the first thing on my "intern duties list" just the other day. 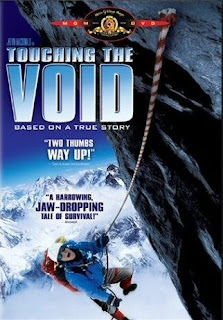 I saw the ultra-classic mountaineering film, "Touching The Void." Originally a book by Joe Simpson, the movie details two climbers ascent, and subsequent epic descent, of Siula Grande in the Peruvian Andes. How I hadn't seen this film before is beyond me, but apparently I can now call myself a climber. Besides simply being an entertaining piece of cinematography, I found myself asking questions during and after the film. What should he have done in the situation? What would I have done in the situation? What is the proper way to go about lowering someone like this? What I realized, after not reaching an answer I felt completely satisfied with, is that in the climbing world it is very hard to define and explain every situation that you will encounter. There are books out there, such as Freedom of the Hills, which attempts to define and diagram every system possible as well as determine when they are appropriate. Regardless of these types of books though, they still can't detail and prepare you for everything you will encounter in the mountains. This realization reiterated the importance of quality training and experience in my mind. Two years ago I was a client of the American Alpine Institute, and went through the Alpine Mountaineering and Technical Leadership, 3 part course. I remember coming off the course with a breadth of knowledge that I simply didn't know existed before. More important than the hard facts however, was the new analytical and judgment skills I had developed over the course of 36 days. Knowing what is "industry standard" and what the climbing community accepts as safe and responsible is absolutely necessary. There really is no excuse for not following accepted practices in the mountaineering world. But when things go horribly wrong and you are in the middle of a situation that doesn't exist in any textbook or guided course, do you know how to think your way out of it? Choosing the right technique or system in climbing is all about having the understanding of the hard skill, and knowing when and how it is appropriate to implement it. Gaining this ability for me, meant taking a guided course with AAI. 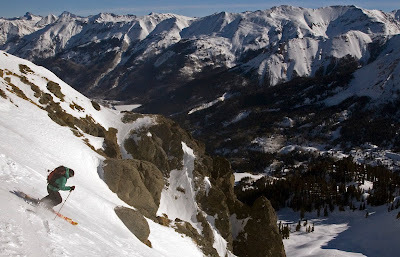 I'm not suggesting this is the only way to learn how to think in the mountains, not at all. I'm simply advocating for beginning, and even advanced climbers to continue to focus on learning "how" to think in the mountains. At some point you have to put down the textbook, and starting gaining real and valuable experience. 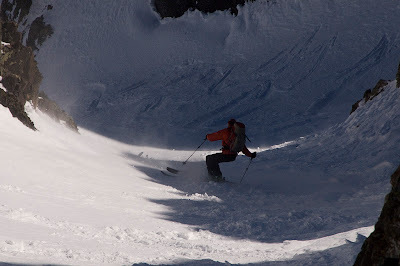 To read a review of Touching the Void, written by senior guide, Jason Martin, click here. “Good morning. This is Pepe calling from Cotopaxi. We had a successful climb this morning. We had excellent conditions, we made good time, and we summited around 6:30. I climbed with Charles and Rebecca. Brian climbed with Ramiro and wasn’t able to make it all the way. There were some low clouds over the Amazon Basin, and we has some very nice colors during the sunrise. It is such a beautiful day today. It is sunny and clear, and the views are great. We can see all the peaks to the north and to the south. Antisana and the Illinizas are the closest, and they are looking very beautiful in their fresh snow cover. There was a little snow yesterday, but it was no problem for us at all. This photo shows the team's route well. It starts at the top of the snow triangle at the base of the mountain (directly below the rock wall), ascends fairly directly toward the rock (Yanasacha), veers to the right before reaching the rock, and then ascends to the summit just to the left of the right skyline. AAI guide Pepe Landazuri called this morning by satellite phone to give us an update on his team’s climbing. Earlier in the week they were thwarted on Cayambe because of extremely high winds, so they did a strategic retreat to some near-by hotsprings to plan their next moves. After a night a Tambopaxi Lodge in Cotopaxi National Park Friday, they moved today to the Jose Ribas hut on the flanks of 19,348-foot/5897-meter Cotopaxi today. "Hello everyone. This is Pepe calling for Charlie [Montange], Rebecca [Montange], and Brian [Semkow] to give you the latest news on our climbing here in Ecuador. Today we are in the refugio on Cotopaxi and all is well. We just had lunch, and in about an hour we are going to leave and move up the mountain part way for some ice climbing on the glacier. We did some good practice climbing on Cayambe on Wednesday, but it will be good to stretch our legs this afternoon and get in some more. The weather has improved, and we are very excited. It’s not perfect, but the wind has largely stopped, and it is plenty good enough for us to climb. So tonight we will leave at midnight and give it a good try. outside my window is the singular focus of my skiing attention this season. Carved like the rhythm of a metronome, was a singular, perfect track down the center of the "Naked Lady." Someone had stolen my line out from under me as if they had snuck into my dreams! I paced about the kitchen wondering when, and with whom, I would ride the waves of the Naked Lady from the summit to valley floor. I could see the plumes of snow coming off my partners skis as they sliced through endless white. And then one day...it snowed, and snowed, and snowed. The avalanche report called for "Extreme hazard, at all elevations and aspects." Some said it rivaled the biggest storm they'd seen in a decade in Silverton. What is meant for me and my Naked Lady...she'd have to wait until things settled out and calmed down. 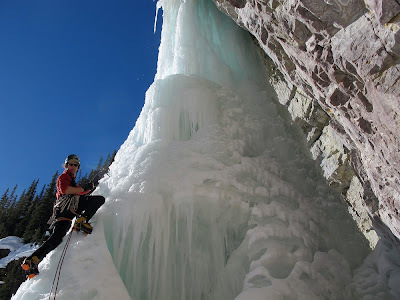 venue in the country, if not the world, to improve upon one's ice climbing, and mixed climbing abilities. 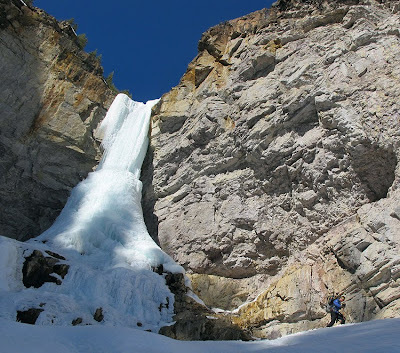 There is more ice than I can shake a stick at, and too many good climbing partners to let a day pass by unused for some adventure. Hence why its been difficult to find any time to change out of my climbing clothes. Whats the point? I'm going to wear them tomorrow anyway! I've stumbled upon that magical efficiency in which all actions lead to the desired end, in this case, climbing. So while my clothes are nearing the spin cycle, I imagine the beautiful snakes of blue ice that are still begging for me to climb them. 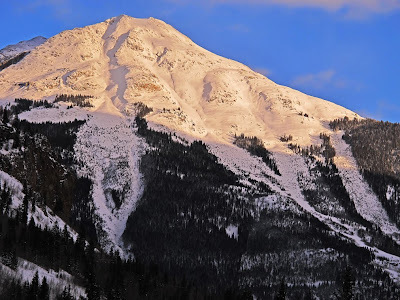 My mind gravitates towards that perfect ski mountaineering line I see every time I drive by Sultan Mountain, "The Elevator Shaft." It, like the Naked Lady, and all the climbs I dream of doing this winter, occupy my mind like a disease, and remind me how lucky I am to be living in the best place on Earth. Steve Casimiro at The Adventure Life posted the following video a couple of weeks ago. If you haven't checked out The Adventure Life, it's definitely time to take a look. They have a very good blog. Parkour can be thought of as being chased by someone. You want to get away as fast as possible, right? But lets say you begin running into rails or walls or other obstacles as such. If you go around them you're only wasting time and energy. The trick of parkour is to use as little wasted movementt while going past an obstacle. This is why most consider tricking and flips "not parkour" as they simply aren't necessary and will most likely slow you down in someway. To parkour is to be able to control your body and mind into one being, so that you can find a path quickly, and move your body in a way that the path can be followed into the next path you're given. If you're running towards and obstacle and start to slow down in order to maneuver around it, most likely you need to practice more. While going about our daily operations, we received a phone call from a nice elderly lady who mentioned she had some mountaineering books she would like to donate. An address was taken down, and our intern Andrew headed over there to see what she had to offer. 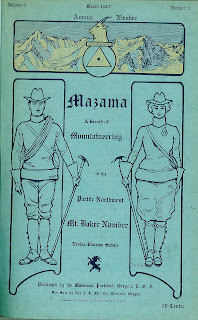 What he found, was a rare collection of books pertaining to both local and international mountaineering history. Most of the books are in pristine condition, and some of them may be impossible to find in a library. They include early editions of books by Heinrich Harrer, Maurice Herzog, and others. We feel extremely privileged to happen upon such an amazing collection, and are discussing ways to share it with the general public. This is the second time in a year that we have received a book donation, and we feel that it would be wrong not to share such amazing and rare literary works with the climbing community. Some of these books are so old (1907) that a route we often climb on Mt. 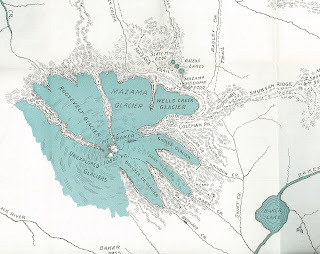 Baker (the Coleman-Deming), is denoted on a map as "unexplored glaciers." It is pretty amazing (and humbling) to think of our predecessors and what their first ascents must have been like.